About 8-10 percent of the total waste stream in Cuyahoga County is composed of food scraps. For individual businesses such as restaurants, food scraps can represent as much as 50% of their garbage. Vermicomposting (composting with worms) has been successfully implemented by a variety of businesses and facilities around the country, including hotels, restaurants, grocery wholesalers and retailers plus recreational facilities. Vermicomposting is also efficient way to compost food scraps from your home. How Do I Compost With Worms? You will need: a worm bin, bedding for the worms, red worms and food scraps. A worm bin is a sturdy box that can be made from materials like a packing crate, a pallet, or plywood and two-by-fours. Concrete blocks can be used to build a more permanent structure. Sturdy weather resistant lids are needed. Worms need to breathe; therefore, the active composting layers should be no more than one foot deep. Drill 1/4-1/2 inch holes in the bottom of your bin for drainage. If intensively managed, a worm bin can have about one square foot of surface area for each 2-3 pounds of food scraps added per week. The number and size of worm bins needed will depend on the amount of food scraps generated. Bedding for worm bins provides the worms with a nest to live and work. 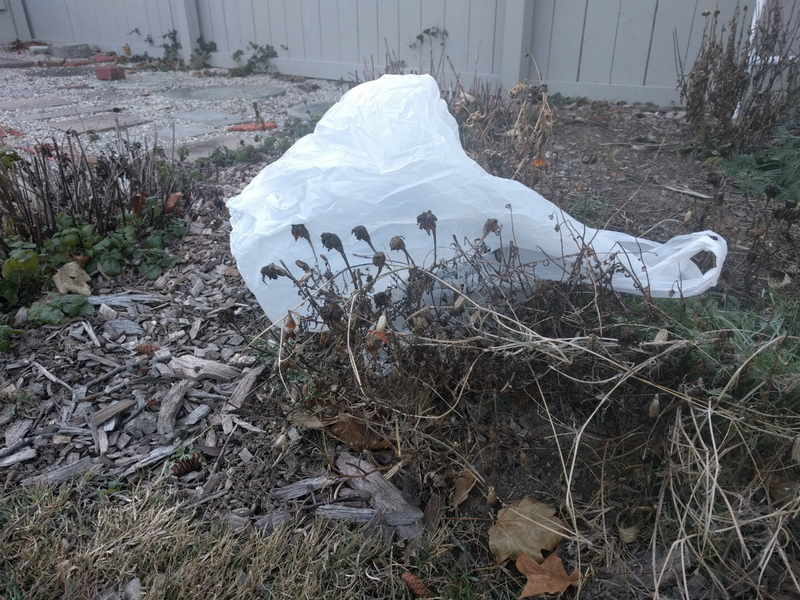 Bedding also holds moisture and serves as a place to bury the food scraps. 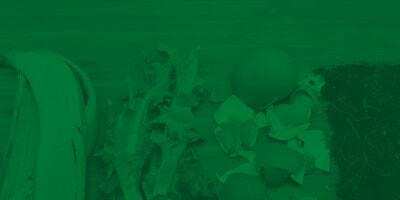 Composting food scraps without bedding can produce bad odors and a slimy mess. Common bedding materials include shredded newspaper or corrugated cardboard, peat moss, coarse sawdust, or fallen leaves. Moisten bedding materials by immersing in water for several minutes before adding to the worm bin. When the bedding is thoroughly wet, remove from the water; wring out excess water. Fill the bin to the top with the loose bedding. Pull apart any compacted paper strips before adding to the bin so the worms have room to roam. Red worms, also known as "red wrigglers" or "manure worms," are the composting champions! Red worms are not the same as earthworms, or night crawlers, that live in soil. Use about two pounds of worms for every pound of food scraps generated per day. A starter batch of worms can be taken from an existing worm bin or can be purchased through stores that sell fish bait. Red wrigglers are vegetarians. 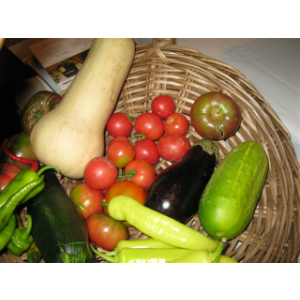 Feed the worms vegetable scraps, grains, fruit rinds and peels, breads, coffee grounds and filters and tea bags. Do not feed worms meat, fish, cheese, oils or oily foods and butter. These foods take too long to fully decompose and are most attractive to rats and other scavenging animals. Feed the worms by burying food scraps in the bedding. Set up a regular collection system for the food scraps and bedding that you will need for the worms. You may need to add shredded paper for bedding or otherwise adjust your ratio of food scraps. Covering food scraps with a few inches of bedding worm castings, or a sheet of plastic, discourages flies and odors. You can build your own bin for minimal cost, using new wood and hardware or recycled materials. Worm bins can also be made from wooden boxes or other containers. Any worm bin must have drainage in the bottom and a tight fitting lid to keep moisture in and pests out. Want step-by-step instructions for building a worm bin? Send an e-mail to Kathleen Rocco. A worm bin is designed for composting vegetable food wastes using red worms. Food wastes and worms are "bedded" in shredded and moistened newspaper, cardboard, peat, or brown leaves. 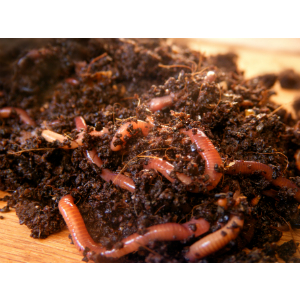 The worms turn both food wastes and bedding into a high-quality compost suitable for use on house plants, seedlings, or general garden use. To maintain a worm bin system, simply rotate burial of food wastes throughout the bin. Every 3-6 months, compost should be moved to one side of the bin and new bedding added to the empty half. At this time, bury waste in the new bedding only. Within one month, worms will populate the new bedding; finished compost may be harvested, and the rest of the bin can be rebedded. During the winter, worm bins should be kept in a cool indoor space, such as a basement or warm garage, to avoid freezing. A properly maintained worm bin is odorless. Bins may be placed in a shady outdoor space the remainder of the year. Flies may be controlled by placing a sheet of plastic over the bedding. A starter batch of worms can be purchased via a worm farm, the nearest fish bait shop, Amazon or at www.planetnatural.com. You can also try finding some in an old compost pile! An excellent source of information on vermicomposting is Mary Appelhof's book Worms Eat My Garbage. If you wish to establish a commercial vermicomposting operation, please contact your local health department for details.